This is the replacement insert for the Neoperl 121350 Perlator 1.0 GPM Regular Aerator. Watercolours® design: color coding to identify flow rate and stream pattern (U.S. Patent pending). Integrated anti-liming Honeycomb replaces conventional wire mesh screens prone to lime build up. Anti-clogging dome screen filters sediment and particles. 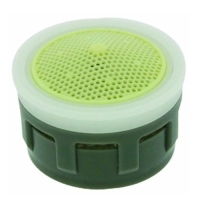 Patented construction provides a splash-free stream, well aerated and soft to the touch. Compatible with all NEOPERL® regular male and female housings, vandal proof and metric size housings. Laser marked housings: statutory mark and custom logo.